You could feel Michelle’s drive, her tenacity, her obsession and occasional mania. You could hear her knowledge, her dedication to the facts, her desire to see this book written properly – to give the victims a voice and see justice served. Michelle was intimately familiar with GSK’s crimes and victims. She knew every piece of evidence, had worked with the cops and the consultants. It’s clear when reading this that one of Michelle’s goals was to make the reader as familiar with these things as she was – to bring you into the hunt with her. To convince you how awful this monster is and get you fired up for his unmasking. I’ve been waiting for this book for months. And just before it was finally mine, GSK was caught. Joseph James DeAngelo. Currently 72 years old. So while I was reading this – taking in every crime, every strange outburst, every clue, every assumption, every sick deed – I was fully aware that this monster had already been caught. And again, this added another level of emotion to the reading experience for me because Michelle is never got to see the ending her story could have had. The crimes are a tragedy. The victims who were assaulted and had to live with that for the last forty years is a tragic. The victims who were murdered, the loss of life is tragic. The officers who started this case, who took over this case, who finished this case – years of their lives, marriages and relationships, all sacrificed to see this man put into handcuffs. And Michelle, a woman dedicated to the very end to this case, who died too young and never got to be a part of this victory. Throughout the crime reporting of the case, the evidence explanations and the theories and clues that are endlessly pursued creates a natural disturbance to your sense of safety. That all of this happened, for real, to fellow human beings, brings an element of real life unease to the book that you just can’t get from fiction. There are also personal details of Michelle’s life divulged, including parts of her childhood and her difficult relationship with her mother. She is honest to almost a fault, seeing no reason to cover up her darker or embarrassing moments. She takes full responsibility for her obsession with GSK, telling the reader about working away online in her daughter’s room, among her toys, after the little girl had fallen asleep; making notes in crayon, becoming oblivious to red carpet events she attended with her husband, preferring instead to ignore celebrities to do research on her phone. She just couldn’t stop. Everything about this case consumed her thoughts. So much so that she confesses to forgetting a wedding anniversary. This manic focus comes through on every page, a palpable energy. But it doesn’t come across as exploitative or disingenuous. It is honest and raw, using the details of the crime to create a demand for justice and empathy, as opposed to entertainment. I’ll Be Gone In The Dark is a bittersweet read because of the author’s own story, and a balanced and detailed work of true crime because of the author’s talent and heart and drive. Highly recommended for fans of true crime and nonfiction, but just to fans of justice and thrillers and good writing, in general. 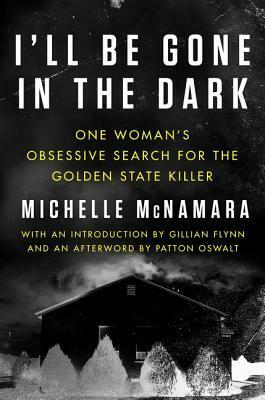 Posted on August 10, 2018 January 24, 2019 by Krystin RachelPosted in 4 Stars, Reviews, Surname: M to ZTagged book, Book Blog, Book Blogger, book reviews, Books, Crime Fiction, Golden State Killer, I'll Be Gone in the Dark, Michelle McNamara, nonfiction, Review, Reviews, True Crime.